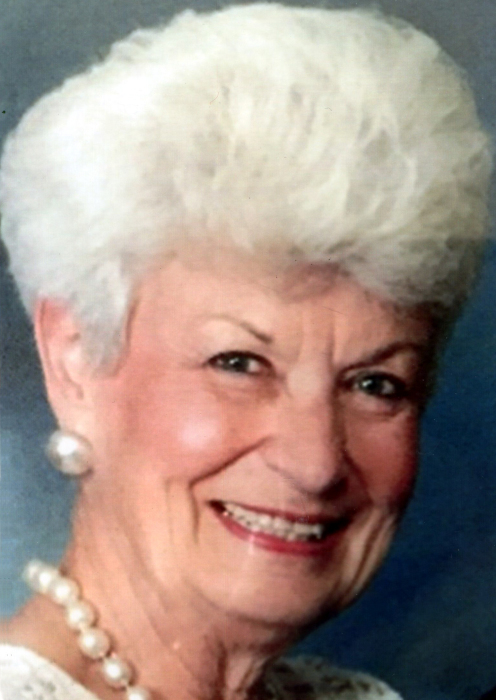 Marian Constance Walsh, 90, of Lubbock passed away December 2, 2018. She was born February 24, 1928 in Amarillo, TX. to Ray and Apolonia Doerfler. A rosary will be held Wednesday at 7pm at Broadway Funeral Directors 1901 Broadway Lubbock, followed by a Mass of Christian Burial Thursday, at 10am at St. Elizabeths Catholic Church, 2316 Broadway. Marian was born and raised with her nine brothers and sisters in Amarillo and attended St. Mary’s Academy, an all girls Catholic school, through her graduation in 1946. She caught the eye of a very handsome young man that attended Price College, the all boys Catholic school in Amarillo, and married Tom Walsh in 1949. Tom was one of nine boys in his family and Marian felt very comfortable in this new and expanded large family. The entire family would often gather to the sounds of lively conversation, happy children and picnics in Thompson Park. Marian was quite a good bowler as a young woman and loved to bowl with her team in competition. In 1967, Tom and Marian moved to Lubbock to begin the next chapter in their lives. Marian lovingly raised her children and supported Tom as he successfully developed and sold two businesses in Lubbock. Marian and Tom loved to go to their retreat in Ruidoso, NM, spending weeks at a time in their lovely home there. Her favorite pastime was watching the hummingbirds buzzing around her feeders on the deck of the cabin. Tom, the love of all of her life, preceded her in death in 2011. She loved to have family around at all times and doted on her children, grandchildren and great grandchildren. She is survived by her four children, Diane Jackson and husband, Rick of Lubbock; Steve Walsh and wife, Patti of Lubbock; Denise Scott and husband Mark of Lubbock; Annette Adkins and husband Keith of Ruidoso, NM; 8 grandchildren; 11 great grandchildren; two sisters, Arlene Bielstein of Webster, Tx; Irene Moore Downey of Amarillo, Tx. The family wishes to extend their thanks and gratitude to the staff at Wedgwood Assisted Living and members of Hospice of Lubbock for their loving care that they gave to Marian and her family. In lieu of flowers, please make donations in memory of Marian Walsh to: Saint Elizabeth’s Saleh Catholic Student Center, 2305 Main Street, Lubbock, Tx. 79401or Catholic Charities, 102 Avenue J, Lubbock, Tx. 79401.